Wales lock Jake Ball will miss most of the 2016 Six Nations Championship because of a knee injury that will sideline him for 10 weeks. The 24-year-old, capped 15 times by Wales, may require surgery after damaging the medial ligament in his left leg during the Scarlets' 27-26 Boxing Day defeat by Ospreys. "He's got a bit of a tear and he'll see a consultant to get an accurate view," said Scarlets head coach Wayne Pivac. "With any luck, it's just a rehab job." Ball received treatment during the Boxing Day derby, but completed the match. The Australia-raised lock last featured for Wales in the 54-9 World Cup win over Uruguay. Wales begin their Six Nations campaign in Ireland on 7 February and conclude it with a home match against Italy on 19 March. 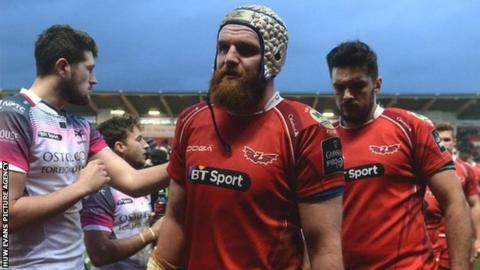 Flanker John Barclay will miss the Scarlets' match against Cardiff Blues on New Year's Day because of a forearm injury that will keep him out for two to three weeks. "It's unfortunate. Jake Ball and John Barclay are two of our experienced players so it's a double blow really," said Pivac. "The good news is that John Barclay's injury isn't as serious as we first thought so hopefully he isn't sidelined for too long. "We thought he may have ligament damage but he's just got a really bad knock." Scarlets back Liam Williams will start running next week as he continues his return from a foot injury. The 24-year-old wing or full-back had surgery after he was injured during Wales' 15-6 World Cup defeat by Australia. "It's good to see him out of the boot and up, starting a running programme, but we need to make sure we get it right," Pivac said. "We don't want to expose him too early, we are obviously aware that there is a Six Nations around the corner so we'll do everything we can to get him right to play for us and for Wales. "He's a fit person normally and is good with his diet so if anyone can get back a week or two early, it's probably Liam."